We proudly introduce “White-painted” from Ms Kyoko Kawai. “White-painted” is commonly used as a structural decoration for Japanese Ikebana arrangement. 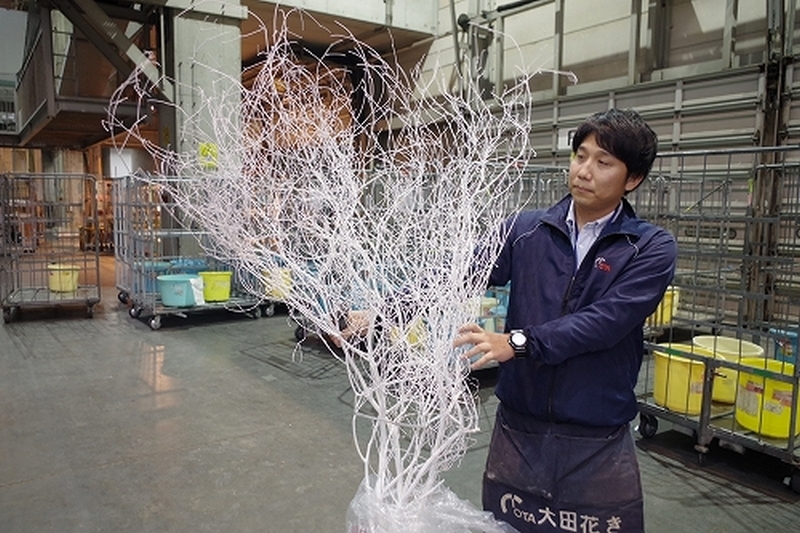 Ms Kawai is a supplier of cut tree branches, mainly. “White-painted” is listed from November, prepared from October while she is busy shipping Autumn-leaf cut branches. It takes at least 4 days to finish it after cutting, removing leaves, painting and drying. We have white-painted Enkianthus perulatus, Rhododendron dilatatum, Rhododendron kaempferi, Clethra and Alnus firma shipped from Ms Kawai. Available length is up to 3 meters. From around December 10, we expect to receive “Red-painted” for the decoration of New Year’s Day in addition to “White-painted”.